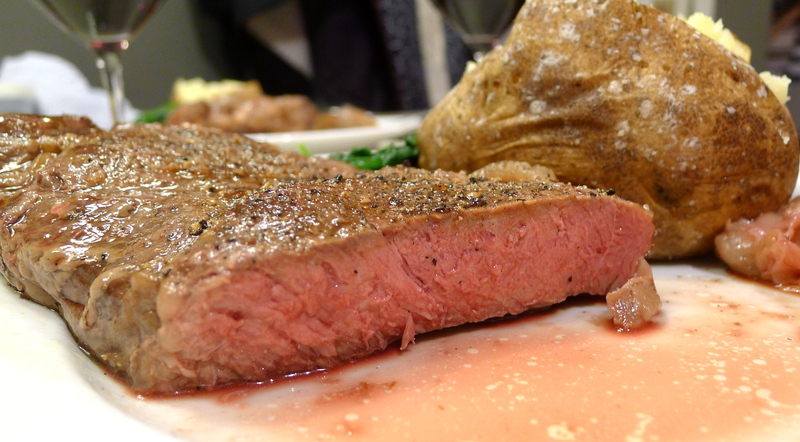 How do you cook a nice, thick steak in a pan? You sear it, right? On high heat to get that nice browned crust. Then you move it to a hot, hot oven to finish. “Sear and blast,” goes the standard mantra. But what if you did the reverse? In pursuit of the perfectly cooked, medium-rare steak without that darned grayish band of overcooked protein ringing the outer edge of the meat, those pesky perfectionists at Cook’s Illustrated did precisely that: they started the steaks in a reasonably cool oven, and then moved them to a hot pan to sear. The result? Very. Evenly. Cooked. Steak. Of course, under the weight of all their test kitchen trials, you might be persuaded that this is the right way, nay the only way to cook your meat. It is fun to try it, though. 1. In order for this method to work, your steaks should be about room temperature before cooking. Be sure to take your steaks out of the fridge, or from wherever you are storing them, ahead of time. 3. Using paper towels, thoroughly pat your room-temperature steaks dry. Season both sides liberally with kosher salt and rub the olive oil all over them. 4. Position the steaks on the wire rack that you have set in the sheet pan. Insert the meat thermometer probe into the center of one of the steaks. You will want the tip of the probe to be parallel to the steak, so the probe should go in the side of the steak instead of sticking straight up. Make sure not to position the probe tip too close to the wire rack or to the top of the steak. Set the timer to go off at 100°. 5. When the timer goes off, remove the steaks from the oven. Remove the probe. Heat the remaining olive oil over medium-high heat until the pan is nice and hot, and oil is not quite smoking. Sear the steaks on both sides. You should remove them from the pan when they reach an internal temperature of 125° for rare, or 130° for medium rare. While the steaks are resting, the internal temperature should continue to rise about 5 degrees. If you feel like this is a bit fussy (those America’s Test Kitchen folks are really fussy! ), you can just sear your steaks for about a minute or two per side and call it a night. 6. Place a nice pat of butter and a good grind of black pepper on each steak before serving. Serve and smile.